Cholera toxin B (CTB) binds the GM1 (Galactosyl-N-Acetylgalactosaminyl) receptor. This receptor is found on cells such as motoneurons, sympathetic pre-ganglionic neurons, as well as cells in the intestinal epithelium. 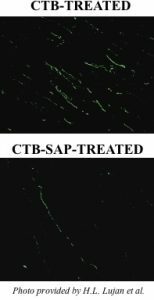 CTB-SAP causes ablation of any cell type expressing GM1, including preganglionic neurons, motoneurons, and astrocytes. Intrathecal injection of CTB-SAP results in elimination of oligodendrocytes and astrocytes and the subsequent demyelination of the spinal cord. CTB-SAP allows the study of a number of demyelinating conditions. Applications include ablation of any cell type expressing the GM1 receptor, including preganglionic neurons, motoneurons, and astrocytes.